Obviously, over-consumption of any food can have a detrimental effect on general health. Recent studies, however, have shown that consumption (in moderation of course) of dark chocolate has many health benefits. So eating about an ounce of dark chocolate every day is actually a good thing! The reason is that when you compare dark chocolate with milk chocolate, dark chocolate comes out trumps when it comes to nutritional benefit. Dark chocolate has more fiber and nutrients, but less sugars and cholesterol. It has to be said that, when talking about dark chocolate, we are talking about chocolate with a cacao percentage of 70% and more. Lowers cholesterol. In studies, dark chocolate has proven to lower LDL (bad cholesterol) and increase HDL (good cholesterol). As we know, too much bad cholesterol is not good for us. These studies showed that dark chocolate actually provided health benefits when it comes to cholesterol. It’s good for the heart. Perhaps the most well-known reason, dark chocolate is good for the heart. Dark chocolate contains nutrients that are known to help lower blood sugar and increase blood flow. In addition, anything that lowers cholesterol is good for the heart. Some observational studies have showed that dark chocolate can reduce cardiovascular death in men by up to 50%. These aren’t scientific studies, but given that dark chocolate lowers cholesterol and can lower blood pressure, then these findings are significant. It improves your skin. Dark chocolate contains lots of flavanols, which protect the skin against sun damage. Of course, this doesn’t mean that you can do without sun cream! However, it does mean that the flavanols will reduce the damage on the skin due to the sun. Therefore, if you are planning a summer vacation, then you could start increasing your intake of dark chocolate a few weeks before your holiday. In general, dark chocolate has a positive effect on the skin. Good source of antioxidants. Dark chocolate also contains a vast amount of antioxidants, which are great for promoting heart health, decreasing risk of infection, and fighting free radicals in the body. The cocoa tree is one of the best source of antioxidants on the planet. This means that its fruits – the cocoa pods also have antioxidant properties. 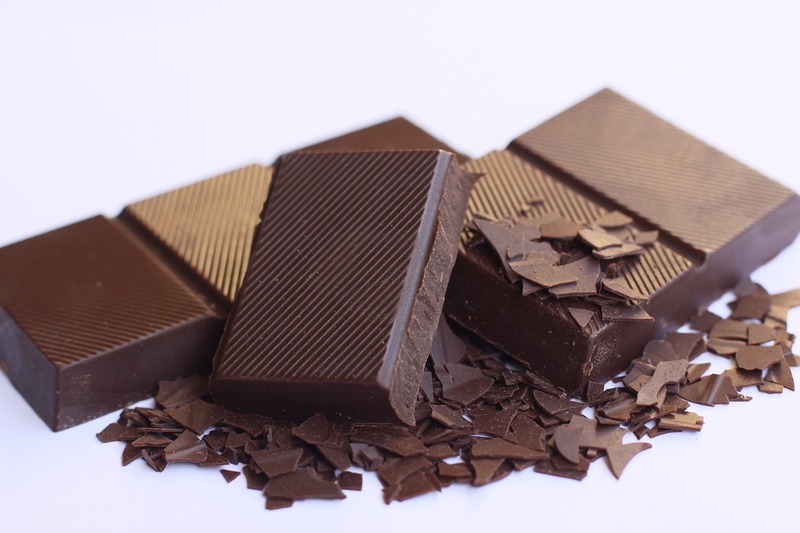 Many studies have shown dark chocolate to have a higher amount of antioxidants than blueberries or Acai berries. Although dark chocolate has a higher calorie, fat and saturated fat content than milk chocolate, its health benefits are much higher than milk chocolate. If you consider that dark chocolate has 22% more iron, four times more fiber and 242 grams more theobromine (the alkaloid which reduces blood pressure) per half bar than milk chocolate, then the picture becomes clearer that dark chocolate has many health benefits. Dark chocolate is definitely the preferred flavor of chocolate when it comes to those midnight snacks or holiday treats. Just make sure you don’t over indulge!